Working double duty as a pharmacy technician for CVS and a professional boxer for Jimmy Burchfield’s Classic Entertainment & Sports, 22-year-old middleweight prospect Thomas Falowo (3-0, 3 KOs) of Pawtucket, R.I., is quickly becoming a household name among New England’s most loyal fans, many of whom have been following the sport religiously since the glory days of Vinny Paz and Peter Manfredo Jr.
Quiet by nature, but raucous inside the ring, the 6-foot-1 Falowo already has three knockout victories since making his professional debut in November of 2010, and will put his perfect record on the line against Russ Niggemyer (2-2, 2 KOs) of Ohio in a four-round bout July 29th, 2011 at the Mohegan Sun Arena on the undercard of “Heat Wave,” presented by CES in association with Global Boxing Promotions. Falowo’s two-day trip to Mohegan Sun will be a welcomed reprieve from his usual hectic schedule, which includes work from 8 a.m. to 5 p.m. at CVS five days a week, followed by training at Peter Manfredo Sr.’s gym in Pawtucket from 5:30 to 7:30; on four of those five days, Falowo squeezes out another hour and a half of running before finally heading home at 9 o’clock – a routine that keeps him in impeccable shape, but leaves little time for a social life. “Work, train and then watch Netflix or surf Facebook – it’s a busy schedule, but it works,” Falowo said. Though he doesn’t plan on leaving his job at CVS anytime soon, boxing is Falowo’s true passion. 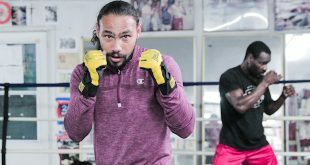 His uncle introduced him to the sport as a teenager when he took Falowo to an amateur boxing show at Balletto’s Gym in Johnston, R.I., that featured Demetrius Andrade of Providence, who went on to star in the 2008 Olympics. “I was immediately hooked,” Falowo said. Falowo eventually joined Manfredo’s Gym, which is within walking distance from where he grew up in Pawtucket, and began working under the tutelage of Manfredo Sr., who guided Falowo through 60 amateur bouts and helped him earn runner-up honors at the New England Golden Gloves and USA Boxing New England tournaments. While Falowo was just beginning his amateur career at 15, other Rhode Island-based fighters such as Jason Estrada and Matt Godfrey were putting in long hours at Manfredo’s in anticipation of their pro debuts, so Falowo always had plenty of guidance along the way. As for his full-time job as a pharmacy technician, that happened by accident. Shortly thereafter, Falowo landed a job at CVS’ Customer Care Center in Woonsocket, R.I., where his responsibilities include sending requests to doctors, answering phone calls for the pharmacy and providing assistance with prescription refills. Having a full-time job outside of boxing has provided Falowo with some much-needed stability; after graduating in 2006 from Shea High School in Pawtucket, where he played football and ran track, Falowo changed jobs – and majors – several times over the next three years. He spent two and a half years at Rhode Island College, first studying to become a nurse before pursuing a career in physical education. He also worked at McDonald’s and the Nike store at the Wrentham Village Outlets in Massachusetts to help save money. Through it all, his ultimately dream was to become a professional boxer, something he realized as far back as his high-school days. “I always liked contact sports,” Falowo said. “When I found boxing, it was the perfect fit. The dream of boxing professionally has now become a reality. After just three fights, Falowo linked up with Burchfield and signed a multi-year promotional agreement in hopes of becoming Rhode Island’s next world champion. July 29th will be Falowo’s first official fight under the CES umbrella. “Only time will tell how great he can be,” Manfredo Sr. said. “He’s always well-conditioned. The more he fights, the better he gets. Can he win the big one? We don’t know that right now. We’ll have to wait and see how he develops as a pro. Any setbacks suffered along the way won’t be for a lack of effort; Falowo’s work ethic is as good as it gets – so good, in fact, that it even made a believer out of his father, a Nigerian immigrant, who originally wanted his son to pursue a different career. 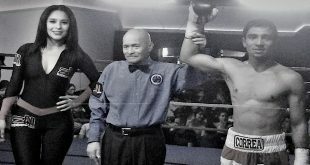 The next step is making a believer out of his mother, who has attended only one fight – Falowo’s debut win over Odias Dumezil at the Twin River Casino in Lincoln, R.I. – since her son turned professional six months ago. 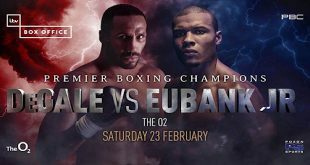 The rest of the boxing world has caught on, captivated by Falowo’s extraordinary volume of punches and overwhelming range, which helps him dish out punishment without taking too much abuse in return. Since his first fight in November, he’s learned to box more on the outside without sacrificing his output, a deadly combination that makes him one of New England’s most feared middleweights. “My greatest strengths are my endurance and my heart,” he said. “When I fight, you can see how hungry I am. Ever since I was young, I always had a lot of energy, and back in my pre-teen football days, I was always known for being in shape, but a lot of it is mental. Falowo’s days of working overtime probably won’t last forever – “When boxing gets to the point where it demands more time from me, I won’t be able to work full-time,” he said – but until he reaches the next level, his job at CVS continues to provide stability while serving as a constant reminder of what he hopes to achieve in professional boxing. “Heat Wave” features two championship bouts – a 12-round showdown between Kevin McBride (35-9-1, 29 KOs) and Mariusz Wach (24-0, 12 KOs) for the vacant WBC International heavyweight title, and a 10-round intrastate battle between Elvin Ayala (23-5-1, 11 KOs) of New Haven, Conn., and rival Israel “Pito” Cardona (36-10, 28 KOs) of Hartford for the vacant WBC USNBC middleweight title. The undercard includes New Haven welterweight Edwin Soto (6-0-1, 2 KOs) battling Michael Denby (3-10-4, 2 KOs) of Felton, Del. 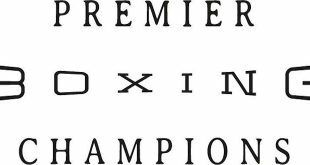 ; undefeated heavyweight Artur Spzilka of Poland (5-0, 3 KOs) facing Philadelphia’s David Williams (6-4-1, 2 KOs), and New Bedford, Mass., welterweight Johnathan Vazquez (4-0, 3 KOs) taking on Agustine Maurus (1-0, 1 KO) of Lawrence, Mass. Cruiserweight Jose Torres of Springfield, Mass., will make his debut against fellow newcomer Pedro Rivera of Southbridge, Mass. ; super middleweight Greg McCoy (2-3-1, 1 KO) of New Haven will fight in a separate four-round bout against Worcester’s Ralph Johnson (0-1); and super middleweight Keith Kozlin (6-2, 4 KOs) of Warwick, R.I., will face Woonsocket’s Reynaldo Rodriguez (5-2, 2 KOs) in a six-round intrastate showdown. Also, former “The Contender” reality television star Jeff Fraza (17-3, 10 KOs) of Haverhill, Mass., will face Pawtucket, R.I., light middleweight Eddie Soto (12-2, 4 KOs) in a six-round bout. The special attraction on July 29th will be an eight-round light middleweight bout featuring Worcester, Mass., veteran and former three-time world champion Jose Antonio Rivera (40-6-1, 24 KOs). All fights and fighters are subject to change. Tickets for “Heat Wave,” which are priced at $40, $65 and $105, can be purchased by calling CES at 401.724.2253/2254 or Ticketmaster at 1.800.745.3000. Fans can also purchase tickets online at www.cesboxing.com, www.ticketmaster.com, or at the Mohegan Sun Box Office. For more information on “Heat Wave,” visit www.cesboxing.com or www.mohegansun.com. Doors open at 6:30 p.m., with the first bout scheduled for 7:30 p.m.